So, as a provisional, accredited or registered teacher/educator in Australia, on your list is doing professional development (PD) or learning every year. Where to start, what to do, and how to do it? This article will be your roadmap on your journey to lifelong learning for your work in the early learning and school sector. Note, for detailed info on Australian teacher registration and standards, click here. What Does Professional Learning Look Like in Australia? 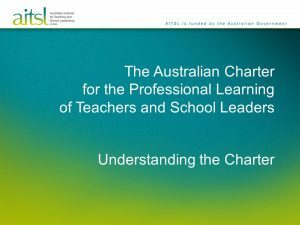 A key document is the Australian Charter for the Professional Learning of Teachers and School Leaders. This 12-page document was released in August 2012 by the Australian Institute of Teaching and School Leadership. It spells out the characteristics of effective professional learning as that which is effective, collaborative and future-focused. Alternatively, the Teaching Board of South Australia paints a simpler picture using the words online learning, research, study, communities of practice and face-to-face to capture types of professional learning. What’s the Policy on Acceptable PD? Not sure what that means? Get your clarification straight from the horse’s mouth – your relevant registration authority. Source your authority’s policy to get an insight Into what’s acceptable and not before you invest your time and dollars in PD. Importantly, you’ll need to know how many PD hours to complete to maintain your registration. It differs in each state, so please check our other articles about accreditation and registration. In NSW, for instance, new proficient teachers need to complete and log at least 100 PD hours over a five or seven-year cycle to maintain their accreditation. Meanwhile, early childhood teachers need to do at least 20 hours of Quality Teacher Council Registered PD and the other 80 hours as Teacher Identified PD or QTC Registered PD and/or further study over the same time frame. There’s more detail for NSW teachers and educators here. Also, ensure you retain evidence of PD you’ve completed. You may be audited, so it makes sense to upload your documents swiftly to your online account with the teacher registration authority in your state or territory. For NSW teachers – National Education Standards Authority (NESA link here) professional development page which includes NESA-registered PD, teacher-identified PD, further tertiary study and NESA-delivered training. For NSW educators (in the early learning sector), check this page of the NESA site. It offers links to NESA-registered PD and lists the increasing number of providers offering registered courses tailored for the sector. For Victorian teachers in the school or early childhood sector, your PD needs to be referenced to the Australian Professional Standards for Teachers (APST) and address one or more standards in each of the three domains of the APST: Professional Knowledge, Professional Practice and Professional Engagement. You must also include training to build your capacity to teach students with a disability. This four-minute video will guide you to find quality PD sources. The registration authority, the Victorian Institute of Teachers, puts the onus on teachers to look at their individual professional learning needs – it doesn’t prescribe activities for you. Victorian teachers in the early learning sector should also check out this page. You’ll find the Queensland education department’s PD calendar here and more resources here. Early childhood educators should go to this government page for the lowdown on PD and support. Educators don’t need to be registered with the Queensland College of Teachers in NQF settings, but some employers require teacher registration as an employment condition. If you’re working in the Australian Capital Territory (ACT), visit the ACT Teacher Quality Institute’s professional registration page and also the one for professional learning. It has a useful infographic sketching the cycle of PL – plan, record, connect, reflect, discuss and track. The Teacher Registration Board of South Australia offers this page of overarching info, but drills down to actual PD resources here. The Teacher Registration Board of Western Australia offers this overview page, which lists formal and informal activities that can be included, but not much more info. You’ll have to log into the Department of Education’s intranet if you’re a Northern Territory teacher keen to find out more about professional learning. According to the Australian Children’s Education & Care Quality Authority, not all educators need to be registered. However, if you work in a preschool attached to a school, registration is an employment condition. This is the home page for the Teachers’ Registration Board of Tasmania. This page details professional development requirements, saying you need to have taken part in that over the past cycle of registration. However, it doesn’t specify how much PD you need “just engagement in professional development activities”. You list these on TRB online just in case the board audits you. Early childhood educators don’t need to register with the board in NQF settings that aren’t kindergartens or schools. Here’s a list of other options that may not have been included in the ‘teaching authorities listed above. It’s not meant to be exhaustive. 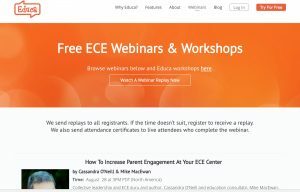 Use Educa for teacher registration. Link to standards, upload evidence, download as needed. To understand the accreditation pathways in Australia, Educa has compiled a comprehensive summary by state. Read about the Australian teacher professional standards and registration pathways click here. To learn more about the EYLF and related requirements, please check out our EYLF overview.